April 1, 2016 – Widely known as the most significant annual global space industry conference, the Space Foundation’s Space Symposium will be held April 11-14 at The Broadmoor, in Colorado Springs, Colorado, attracting thousands of participants from dozens of countries, including the world’s leading decision makers from civil, military, government, commercial and academic institutions. The 32nd Space Symposium will officially launch on Monday evening, April 11, with opening remarks by Colorado Governor John W. Hickenlooper and Space Foundation CEO Elliot Pulham. The opening ceremony is sponsored by Northrop Grumman, with corporate host, Jeffrey D. Grant, Sector Vice President and General Manager of Space Systems, Northrop Grumman Aerospace Systems. The opening ceremony will be followed by the grand opening of the Lockheed Martin Exhibit Center and Pavilion, featuring the world’s latest space technology, equipment and services. The evening concludes with fireworks lakeside, co-sponsored by Intelsat General Corporation. Bill Nye, Chief Executive Officer of The Planetary Society, will moderate the “Science” panel Tuesday afternoon, April 12. The 32nd Space Symposium program will include a Technical Track, two classified tracks, discussion of emergent space technology, international space panels and a New Generation Space Leader program. The Symposium’s Lockheed Martin Exhibit Center and Pavilion will feature more than 180 displays of the world’s latest space technology, products and services. 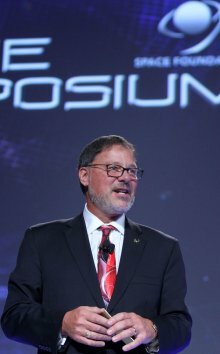 See all of the confirmed speakers for the 32nd Space Symposium at www.SpaceSymposium.org.